Klaus Rummler und ich haben für die Frühjahrstagung der DGfE Sektion Medienpädagogik (Medien – Wissen – Bildung: Freie Bildungsmedien und Digitale Archive), die am 11. und 12. 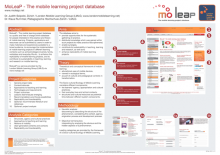 April 2013 in Innsbruck stattfand, ein Poster zur MoLeaP – Mobile Learning Projektdatenbank eingereicht. 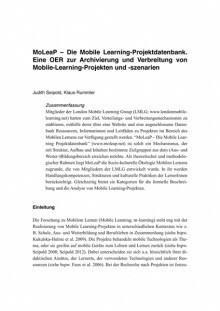 Das Abstract dazu ist weiter unten sowie im Programmheft der Tagung einsehbar, das Poster kann ebenfalls am Ende dieses Posts sowie über die MoLeaP-Website aufgerufen werden. Last year, we attended the Online Educa in Berlin and met several interesting people who we interviewed for the “Radio Live at OEB” internet radio show, realised by Pontydysgu. Doing this was a new experience and great fun. Hope to be involved in one of the shows sometime in the future again, e.g. the one live from MLCB in Bremen. 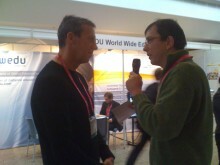 The interviews listed below were done during the 2 days of OEB10. They are available on the Ponty website. On day 1 of OEB10, Graham Attwell and Eileen Lübcke did the floor-management, Jenny Hughes, Klaus Rummler and myself, Judith Seipold, made the interviews. After the live shows, we met several people and recorded the conversations and interviews. They were not aired during OEB10, but are available now on the Pontydysgu website.